Cement, hydraulic inorganic cementing material powder. After mixing with water into a paste, can be hardened in the air, or hardened in water better, and be able to sand, stone and other materials, firmly cemented together. Cement is an important building material, made with cement mortar or concrete, firm and durable, widely used in civil construction, water conservancy, national defense and other projects. Cement used in construction is characterized as hydraulic or non-hydraulic. The most important use of cement is the production of mortar and concrete: the bonding of natural or artificial aggregates to form a strong building material that is durable in the face of normal environmental effects. The most important used of cement is the production of mortar and concrete. During this process, we need cement crusher, cement grinding mill, cement feeding equipment, cement conveyor equipments etc. ZENT cement grinding mill is used for grinding the crushed material, and then to smash the key equipment. Cement grinding mill is widely used in cement, silicate production, new building materials, refractory materials, fertilizer, ferrous and nonferrous metal and glass ceramics and other mineral production industries of all kinds of ores and other grind-able materials can be dry or wet grinding. According to the grinding mill working process, we can divide traditional cement mill into cement ball grinding mill, raw material mill, clinker grinding mill etc. Cement ball mill is the key equipment for grinding after the cement crush process, which is widely used in the manufacture industries, such as cement, silicate, new building material, refractory material, fertilizer, ferrous metal, nonferrous metal and glass ceramics, etc. ZENT cement ball grinding mill consists of feeding part, discharging department, rotary department, the ministry of transmission (reducer, small transmission gear, motors, and electrical control) and other major components. There are dry cement ball mill and wet cement ball mill depending on the input raw materials. Ball mill used in cement processing is called ball cement mill or cement ball mill according to its application. According to the ball mill applications, ball cement mill has a strong adaptability to raw materials, to continuous production, crushing ratio, easy-to-speed grinding fineness of the product characteristics. Ball cement mill consists of feeding part, discharging department, rotary Department, the ministry of transmission (reducer, small transmission gear, motors, and electrical control) and other major components. ZENT ball cement mill adopts cast steel hollow shaft, lined with removable, so it has good wear resistance. 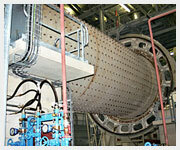 Our ball mill can be operated smoothly, worked reliably in cement processing plants or cement production lines.